A missile is launched during a long and medium-range ballistic rocket launch drill in this undated photo released by North Korea's Korean Central News Agency (KCNA) in Pyongyang on August 30, 2017. WASHINGTON - North Korea’s firing of a ballistic missile over Japan could increase pressure on Washington to consider shooting down future test launches, although there is no guarantee of success and U.S. officials are wary of a dangerous escalation with Pyongyang. More attention is likely to focus on the prospects for intercepting a missile in flight after North Korea on Tuesday conducted one of its boldest missile tests in years, one government official said. Such a decision would not be taken lightly given tensions over North Korea’s nuclear and missile programs. And while President Donald Trump has repeatedly vowed that “all options are on the table”, there has been no sign of any quick policy shift in Washington toward direct U.S. military action. 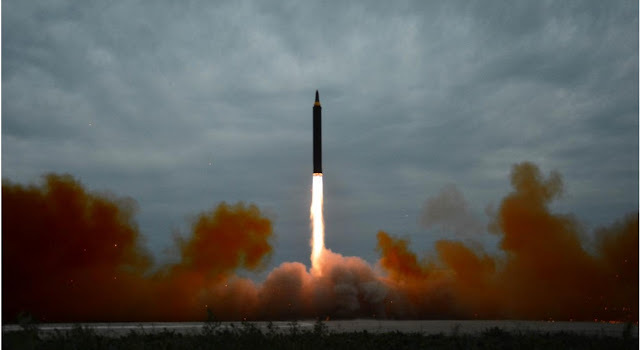 But Pyongyang’s launch of an intermediate-range Hwasong-12 missile over Japan’s northern Hokkaido island underscored how Trump’s tough rhetoric, pursuit of sanctions and occasional shows of military force around the Korean peninsula have done little to deter North Korea’s leader. “Kim Jong Un has chosen to thumb his nose at the Americans and Japanese by conducting this test,” said David Shear, former U.S. assistant secretary of defense for East Asia. U.S. Defense Secretary Jim Mattis has already pledged that the military would shoot down any missile it deemed a danger to U.S. or allied territory. What is unclear is whether Washington would be prepared to use its multi-layered missile defense systems to intercept a missile like the one that overflew Japan but never directly threatened its territory. Doing so would essentially be a U.S. show of force rather than an act of self-defense. “I would think that in government deliberations that would likely be one of the options out on the table,” Shear said. Some analysts say there is a danger that North Korea would see it as an act of war and retaliate militarily with potentially devastating consequences for South Korea and Japan. China, North Korea’s neighbor and main trading partner, would also likely oppose such a direct U.S. military response. Experts say there is no guarantee that U.S. missile defense systems, including Aegis ballistic missile defense ships in the region and Terminal High Altitude Area Defense (THAAD) systems based in Guam and South Korea, would hit their target, despite recent successful tests. A failed attempt would be an embarrassment to the United States and could embolden North Korea, which this year has already conducted two tests of an intercontinental ballistic missile believed capable of hitting the U.S. mainland. The United States has spent $40 billion over 18 years on research and development into missile defense systems but they have never been put into operation under wartime conditions. Mattis this month expressed confidence the U.S. military could intercept a missile fired by North Korea if it was headed to Guam, after North Korea said it was developing a plan to launch four intermediate range missiles to land near the U.S. territory. If North Korea fired at the United States, the situation could quickly escalate to war, Mattis said. Not everyone is convinced the U.S. military can defend against North Korea’s growing missile capability. Some experts caution that U.S. missile defenses are now geared to shooting down one, or perhaps a small number, of incoming missiles. If North Korea’s technology and production keep advancing, U.S. defenses could be overwhelmed. “If a shootdown fails, it would be embarrassing, though not terribly surprising,” said Michael Elleman, a missile expert at the 38 North think tank in Washington. “Missile defense does not provide a shield that protects against missiles. Rather, it is like air defense; it is designed to minimize the damage an adversary can inflict,” he said. One U.S. official said the military would be especially cautious about shooting down a North Korean missile that did not pose a direct threat because of the risk of civilian casualties if it were intercepted over Japan or South Korea, as well as difficulty in determining how Pyongyang might retaliate. The official spoke on condition of anonymity. U.S. military and intelligence officials warn North Korea could unleash a devastating barrage of missiles and artillery on Seoul and U.S. bases in South Korea in response to any military attack. Targeting of a North Korean missile in flight that did not endanger the United States or its allies could also raise legal questions. U.N. Security Council resolutions that ban Pyongyang’s ballistic missile programs do not explicitly authorize such actions. Japan also faces questions over the legality of shooting down missiles in its airspace but not aimed at Japan. Under legislation passed in 2015, Tokyo can exercise a limited right of collective self-defense, or militarily aiding an ally under attack, if it judges the threat to Japan as “existential”.